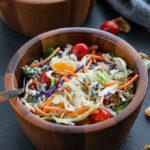 I always love adding cabbage to salad for that delicious crunch – so I bet the coleslaw mix is right up my alley! Love that this is a clean out your fridge type of meal. So easy + so packed with nutrition! Perfect way to start January! Thanks Haylie! This was seriously one of the easiest salads I’ve ever made, and I’ll definitely be eating it on repeat for a while. Happy January! Thanks Kelsie! 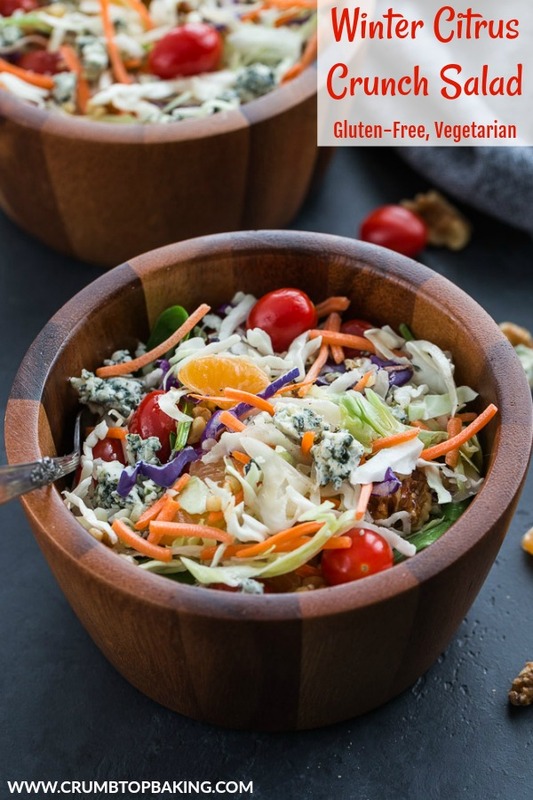 The blue cheese is one of my favourite parts about this salad. I eat a lot of salads too, and sometimes cleaning out the fridge really does yield some gems! Thanks Dawn! Yes to all the veggies too! My body is craving it. I hope you had an amazing holiday season as well. I’m looking forward to 2019! I like the suggestion of using bleu cheese. I bet I’d love that. Any salad with Clementines in it is good with me! Thanks Jeff! It had been so long since I added blue cheese to a salad. I’m definitely going to be doing it more often! This is just what I need right now Leanne! I’m loving the entire ingredient list and that dressing! Thanks Mary Ann! This salad hit the spot for me this week. Hope you get a chance to make it! I’m glad you decided to share! I do love walnuts, so those would definitely be staying but I’m not a fan of blue cheese, so I’d be swapping it out for feta! A crunchy, citrusy salad sounds like just the ticket to kick off this new year! Thanks Katherine. Yes, blue cheese isn’t for everyone. I find people either love it or hate it. Feta would be awesome in this salad too! I love all of the ingredients in this salad and they’re all so much better together!! My parents brought us a bunch of clementines from their tree when they were here for the holidays – this salad looks like the perfect way to enjoy them! Thank you! And Happy New Year to you too Marissa! Clementines always remind of the holidays. So nice to have fresh ones from your parents’ home grown tree! Enjoy! I think winter gets a bad rap because it’s full of delicious produce…this salad is proof! Cabbage is a favorite of mine because I love the crunch factor, and all of these flavors sound so great together. I could eat this every day! Thanks Marcie! I’m definitely trying to appreciate all the winter produce. And this salad is certainly going to be on repeat for a while! Have a great weekend! I love how easy and delicious this is! Pictures are amazing too. Blue cheese is the best for a salad like this! I need to try it!! Thanks Joyce! Hope you get a chance to make it. The blue cheese really adds a nice flavour! I love a big, colourful salad in January after an indulgent holiday season and this one is gorgeous! Clean out the fridge meals are the best — I find I end up pairing ingredients I never would have otherwise. I could go for a bowl of this for lunch! Thanks Justine! This salad has been on repeat since the holidays. I actually just had another bowl for lunch today! And I totally agree. The salads I enjoy the most are usually the ones created from random ingredients when I clean out the fridge! Yes! 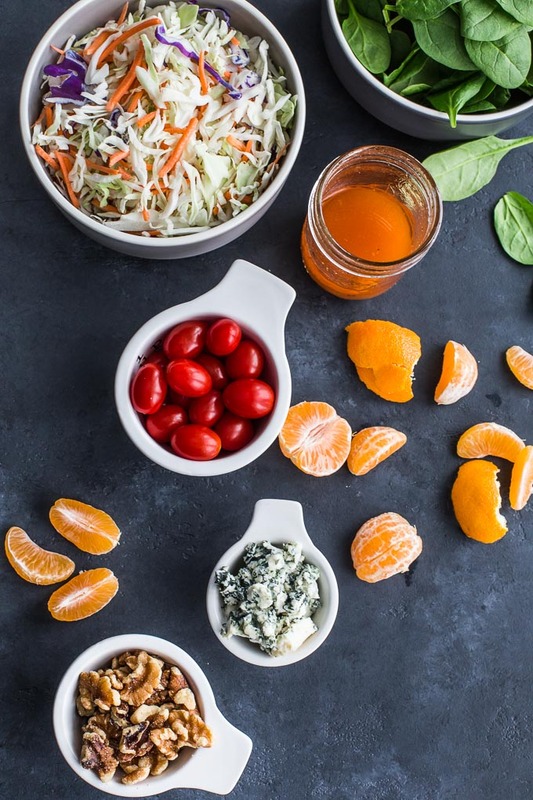 Salad with citrus – especially sweet little clementines – is a winner in my book! And the addition of crumbled blue cheese sounds wonderful! This will definitely be added to my rotation!! Pinned! Thanks for pinning Annie! I hope you like this one. I’ve been enjoying it for lunch quite a bit lately. 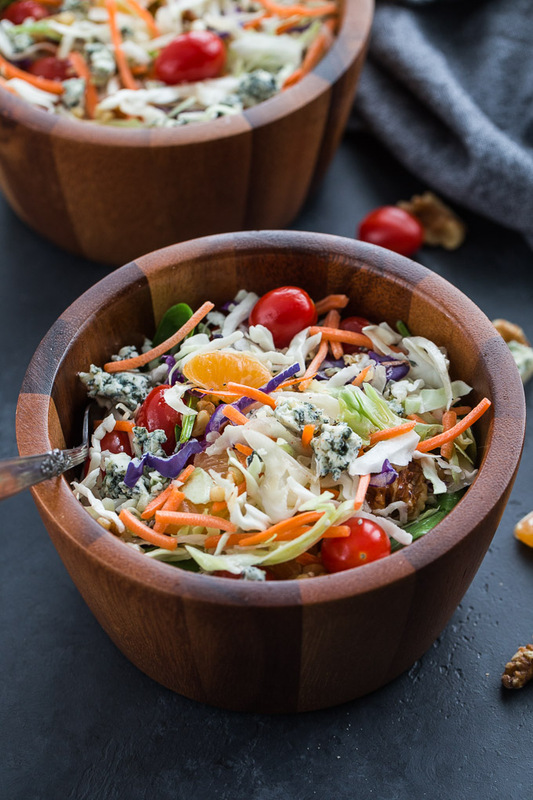 The blue cheese pairs nicely with the tangy dressing! Citrus always adds some sunshine to winter, for me. 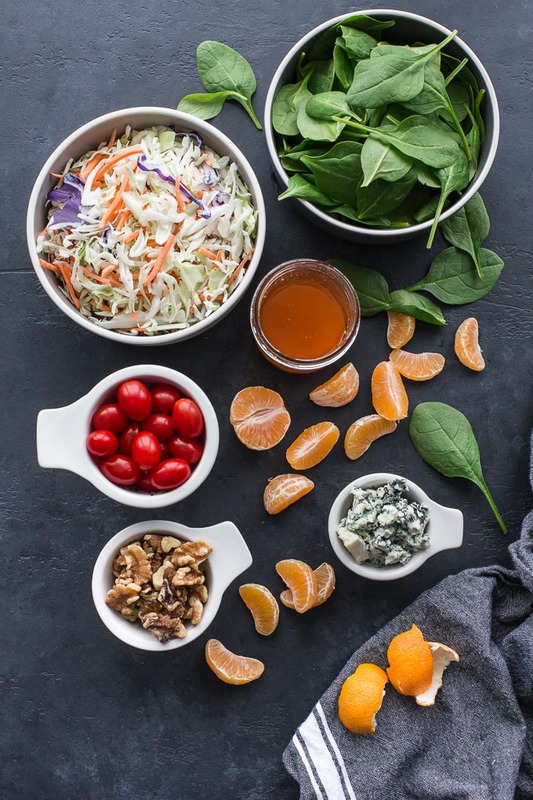 And this salad looks like a perfect way to use up the clementines in my fridge. Delicious! Thanks Colleen! That’s exactly why I love adding citrus to salads this time of year. It adds a little hint of sunshine on cold January days! Thanks so much Puja! I’m definitely appreciating all the winter produce this year! Glad you like the recipe. Hope you get to try it some time! Such a perfect salad for a winter reset. Very healthy but comforting. Thanks for sharing! Thanks Philip! A filling salad can definitely be comforting! Yes, you have so many great salad recipes Elaine! I’ve added shredded chicken to this one, and it works really well! And big blue cheese fan here too. I don’t know why I don’t add it to my salads more often! Love everything about this salad! I can’t wait to make it! 🙂 Pinning! Thanks Kim! I hope you like it! This is such a great way to start the New Year off right. Thanks for the salad inspiration I needed Leanne! Glad this one inspired you! Thanks Yvonne! I am not sure if anyone else is like me but I find that I am desperate for fresh vegetables after travelling. 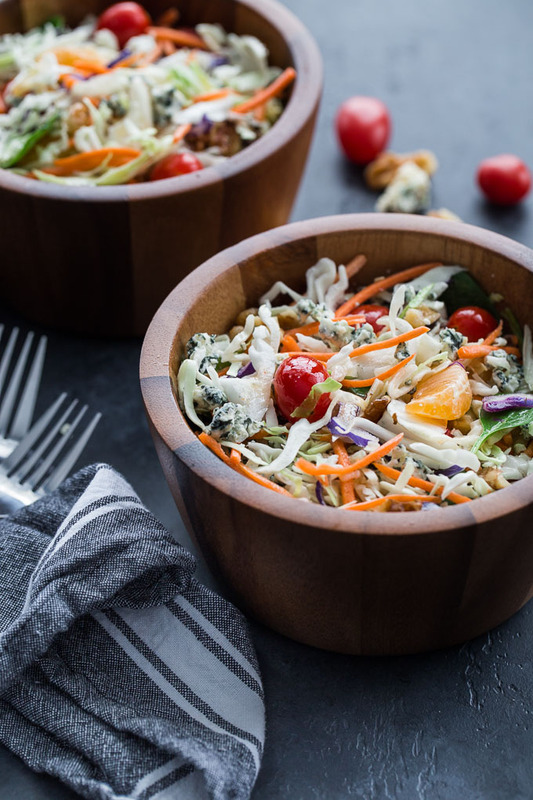 I would love to come home to a bowlful of your beautiful Winter Citrus Crunch Salad – so appealing, so healthy! Many thanks for the inspiration, Leanne! I am definitely pinning it to my “Salad Savvy” board. Thanks so much for pinning Denise! And you’re not alone. While I try to eat fruits and veggies while I travel, sometimes its challenging, and I definitely crave them when I come home! I can;t get enough winter salads right now! This looks delish. I would totally use some fresh OJ just to make it even more gourmet. Thanks for sharing!! Thanks Sharon! Winter citrus and lots of greens have been a staple these past few weeks. 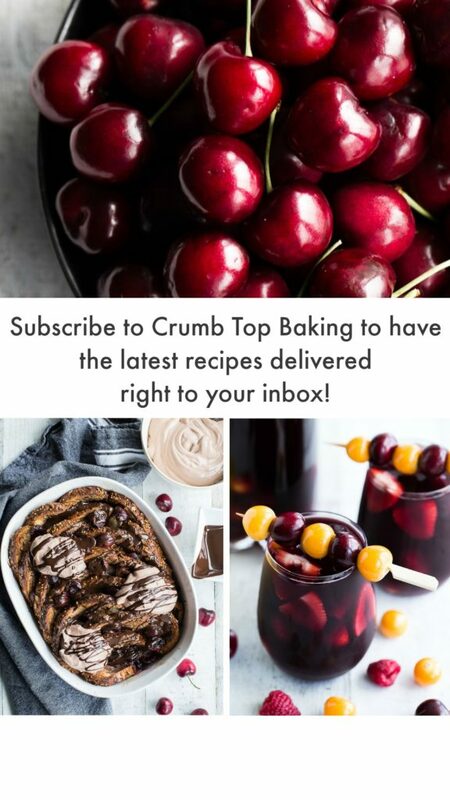 Glad you like the recipe! Oh believe me, I’m looking for ways to get back on track. I had wine and some form of junk food EVERY DAY over the holidays! Thank you for this delicious inspiration! Thanks Terri! I was craving this one after the holidays! Hope you had a lovely time celebrating!